Including user friendly software with many features. Maxtel USB Voice logger aims to deliver unique portability and flexibility and functions as the High-migration development tool or small-scale portable system for customers. The Maxtel USB Voice logger is specially designed for worldwide analog interfaces for its high compatibility with international telephony environments. With terminate interface capacities, it features programmable voltage thresholds, loop polarity reversal and multiple event triggers, and can easily be configured to accommodated to diverse analog networks worldwide. The unit is available in 1, 2,4,8 or 16 line configuration. It is highly recommended that a dedicated PC is used for the recording server. Automatic gain control of record and play to ensure the volume balance of two speakers. The amount of calls made/received is recorded. Can manage client and recording , show the telephone number and client data. Full digital mode for record and playback, duplex reproduction of the call recorded, hard disk of 1G able to record 175 hours. Visual interface: 800X600 figure resolution display provided. Detailed display of working mode, operation indication and query result record. Caller ID: The telephone number of the caller is displayed. Quick search: quick search and print of detailed call record; search and print functions of channel number, call date, phone number, company name. Print function: print the query result to a local or network printer. Deleting records: Once designated record space is reached, automatic deletion of the earliest records will take place. Parallel operation: record, call record, search and playback at the same time. Network function: management of the equipment with search and playback of record through network ; Internet or LAN. Safe and reliable: A classified password can be set for management access and confidentiality of all call records. 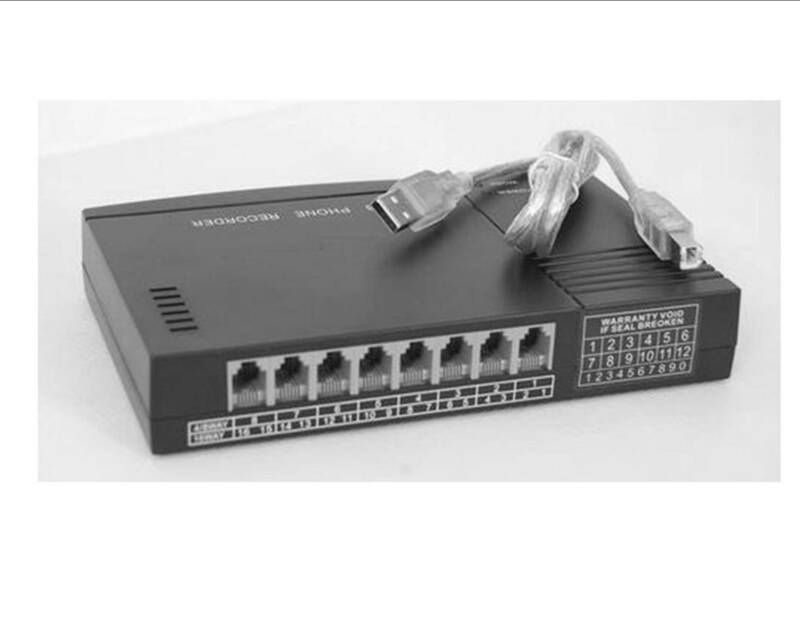 The hardware is very reliable and user friendly. 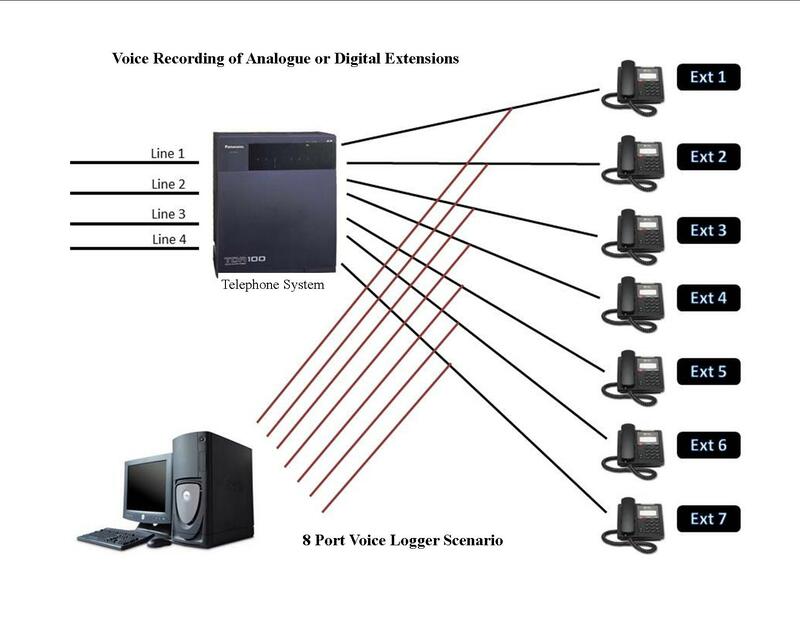 There are three recording modes available on the voice logger system for you to select : Voltage, Audio and manual recording. Voltage control: This records the line according to voltage change, e.g. begins when telephone handset is lifted and then ends when the handset is replaced. 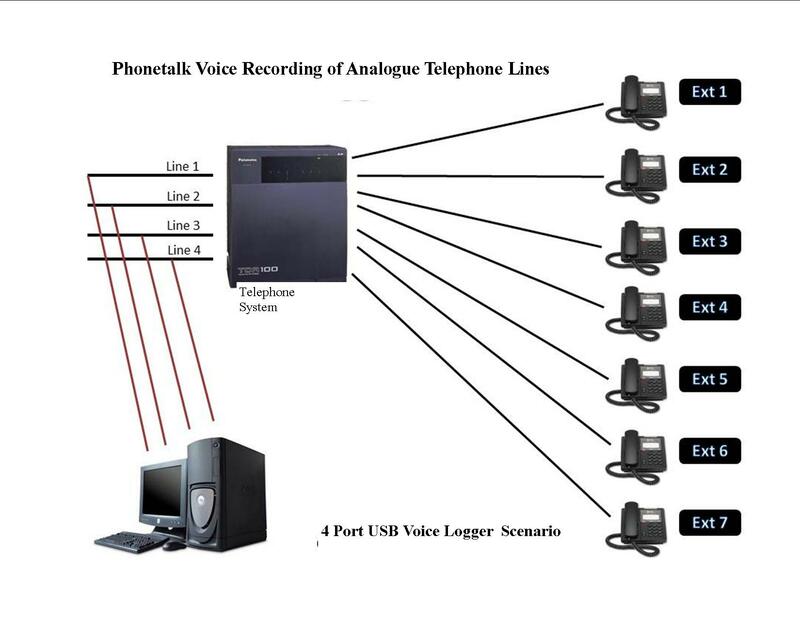 Audio voice control: This recording mode is selected when connected to any digital or voip telephones utilising Phonetalk's Digital Adapter. The Voice logger gives you the convenient option of automatically recording incoming and outgoing calls. You also can select the manual option to selectively record the conversations at the click of a button. Why Record Your Phone Calls? There are many reasons why recording your calls can be good for your business. An increasing number of companies are recognising the benefits of recording calls regardless of business size. Historically, call recording has been a high end application for call centres and financial institutions such as brokers where high-value transactions or a high volume of business is key. A large number of companies have a team of individuals whose primary purpose is to deal with customers over the telephone. Often the telephone is the only communications exposure a customer has with an organisation. It is also true that individuals within any one organisation often vary greatly in their effectiveness when dealing with customers, this effectiveness translates to revenue, margin and profits. Call Recording is also a superb tool to allow a supervisor to review the performance of a team member and to listen to specific calls with a view to grading or offering assistance and advice for further improvement. Often telephone-based staff are on some sort of commission structure, so the concept of self or supervisor related improvement is to the benefit of both parties if more, higher margin sales are made as a result. Call Recording can be seen as 'Big Brother', team members will undoubtedly change some aspects of their telephone behaviour as a result of implementing call recording and you may even see an increase in productivity to cover the investment for this reason alone, but it's also important to respect staff privacy and their expectations to privacy, so we recommend that you inform your staff why you are implementing a recording system (emphasise the benefits to them) and allow staff to be able to make or take the occasional personal call (dependant upon your own policy) on a telephone that is not recorded. Confirmation - You simply wish to go over the detail discussed again before formally documenting an arrangement. We can't be expected to remember or take notes on everything when we're engaged in conversation. Call recording is ideal to step back through the conversation to make sure our documentation covers the 'spirit' of theagreement and that we haven't missed anything out. We all have experiences where we made a verbal telephone order and didn't get exactly what we asked for. Most of us unfortunately know someone who will always seek compensation in every situation and will often be successful due to the 'Customer is always right' principal. Recording the transaction allows rapid identification & replay of the original order, if your organisation was in the wrong, you need to know and sort the cause before it happens again. If you were right, you simply need to prove you performed as requested and avoid expensive compensation and loss of reputation, either way your company benefits and you may well find that just in dispute resolution alone, your call recording solution is financially justified. If you've just finished a fantastic call with your biggest customer and you want to share the positive experience & detail with your colleagues, recording and emailing the call in a wav format is a superb way of getting their attention and excitement. You may also simply wish to pass on a message without writing it down, in which case, record the message and email it!. Premium rate telephone services are regulated in many countries as the caller needs to be aware of the growing cost of extended calls and generally cannot be seen to be encouraged to stay on the call for an extended period. Recording calls in this situation has two benefits, it allows the abused employee to highlight the level of severity of the call and also may help prove who the caller was, or that the call was genuine abuse and not harmless banter.